I intend to make some American addons for Pak192.comic. I just compiled a preliminary version of an EMD SD60M, a freight locomotive. This is my first attempt at making an addon, so I welcome any advice or criticism before I finalize it. Can you give us a downloadlink? 2. More definition. It's too blurred. Welcome, rc1, it's nice that you chose pak192.comic as your playground. To be able to show you exactly what's "wrong", I attached an image. It's your train, but I pixeled over it. It's not intended to be finished like that, just a quick job to show you what we understand as a Comic graphic. Of course more details and better Anti-Aliasing is allowed, but "blur" is bad. It's best to restrict yourself to a palette of about 6-8 shades per color. This helps defining a crisp image and allows easy conversion to player color. 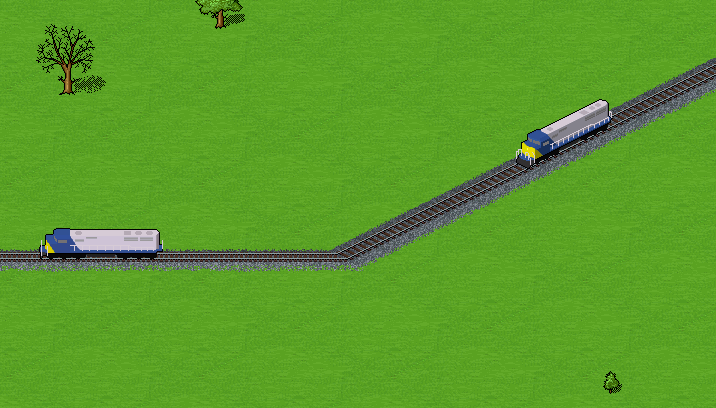 That being said, I doubt your train is pixeled in the first place, it looks more like it is rendered. I don't think there is much you can do about it, except pixeling over the whole thing like I did after rendering. I don't agree with an_dz about the colors, they are fine with me. But since it's blue and yellow, I'd definitly use player colors. You're new "crispy" version has the colours I had in mind. The grey has improved, that made the difference. Leartin, I understand what you mean about the colour and I think I should be able to improve the faces. Citarofahrer, I will certainly provide the link after I make the necessary improvements (unless you specifically want this WIP version for some reason). I got around to doing some more work on the locomotive. Would you agree that this is closer to the style you were recommending? I also made it smaller in an attempt to make it proportional to the other trains I compared it to, but there was lots of guesswork involved. I think the lighting should now be consistent with a source in the lower left corner. I'm still not completely satisfied but I think it is improving. Is there anything else that anyone would suggest?